Well hello there people. This is my first ever game review, not just for this site, but in general… Fun times, eh? 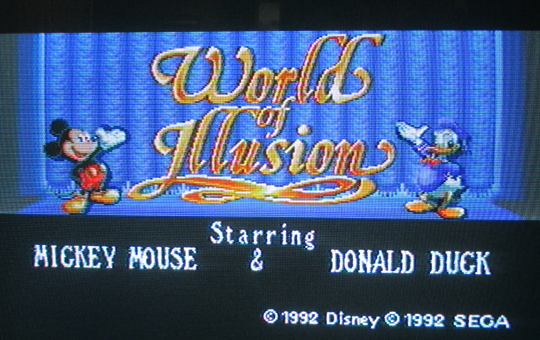 The game I’m going to be reviewing is World of Illusion: Starring Mickey Mouse & Donald Duck, which was part of a series of Mickey Mouse games developed for Sega consoles in the 1990s featuring the word “Illusion” in the titles. 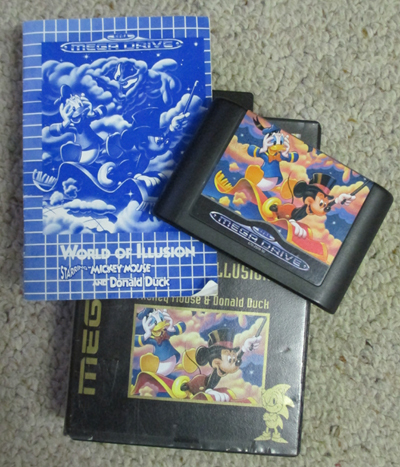 The other games in this series were Castle of Illusion (released for Mega Drive in 1990, Master System and Game Gear in 1991), Land of Illusion (released for Master System in 1992 and Game Gear in 1993), and Legend of Illusion (released for the Game Gear in 1995). game I have fond memories of playing back in the 1990s with my older brother on our Sega Mega Drive (which I thankfully still have!). We used to hire it out a lot from the local video shop and play it together. I can’t quite remember what drew us to it, really, perhaps the characters and content, the bright cover, or it could very well have been from reading a review of it in one of the many Sega magazines we used to buy back in the day (most of which I still have, aah nostalgia!). Either way, it was the 2-player aspect of this game that made it more fun to play, if a little bit frustrating at times if one person should fall behind or get stuck. So what’s the premise of this game then? Basically, while preparing for a magic show, Mickey Mouse and Donald Duck find a magic box belonging to an evil magician, who just happened to leave it lying around, as you do. 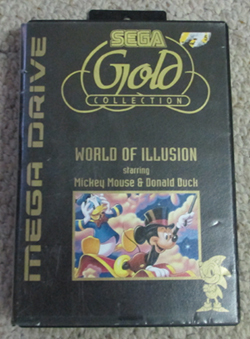 Donald makes the mistake of opening it and the two of them get dragged into a magical world that they must then escape from, while battling evil creatures along the way using their magic capes as weapons. 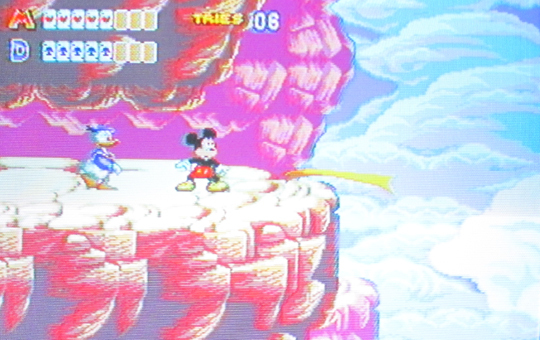 You can play as either Mickey or Donald on their own or together in the two-player capacity, the latter involving a good amount of team-work to get the job done. As with most of the Mega Drive games I’ve played over the years, the graphics in this one were really quite impressive for its time. 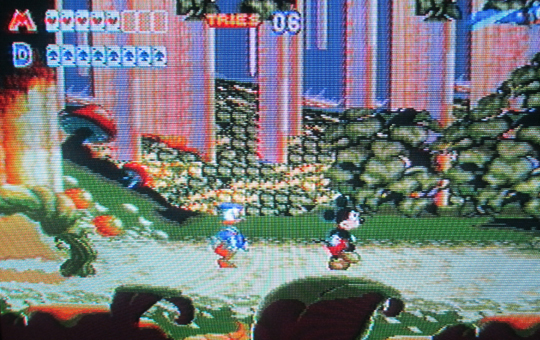 Though given how amazing the graphics were in other Disney games on the Mega Drive (such as The Lion King, Toy Story and Aladdin), it’s not too surprising that this would be equally as good. Everything is rich in detail and brightly colourful, albeit slightly cluttered in some levels which can make things a touch distracting. The music is also quite pleasant, if a bit boring and repetitive after a while. It’s cute and quirky and changes depending on the level, and is in keeping with a magical, Disney sort of feel. The sound effects are appropriate and the characters also speak at times which adds to the fun of the adventure. After playing this game for the first time in several years for the purpose of this review, I found it incredibly easy to pick up again. That shows just how simplistic the gameplay really is, so it’s sadly less than challenging, and the big bosses at the end of each level are far too easy to defeat. It’s also rather slow in pace (which isn’t quite as much fun for the speed-demon Sonic the Hedgehog fan I am), but these simplicities are what make it a good game for younger children to play or anyone who just wants a laid-back sort of gaming experience without too many complexities. I can imagine it’d be great for the 30-somethings out there who want to get their young kids into retro gaming, along with more challenging platformers like Sonic and Mario. And if you want to look at it from a more meaningful perspective, it’d be a fun way to teach children the values of patience and team-work by using two of Disney’s most famous and treasured characters in the process. Overall I’d rate this game at about a 7/10. It’s not perfect, but then again what is? It’s just a bit of fun, and for me that was always the main thing when playing video games as a kid, and still is as an adult. 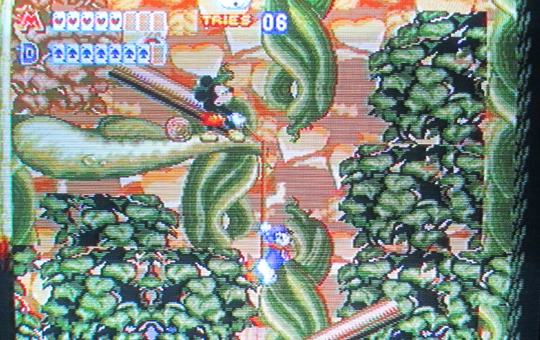 Mickey gives Donald a hand… Or rope, as the case might be. 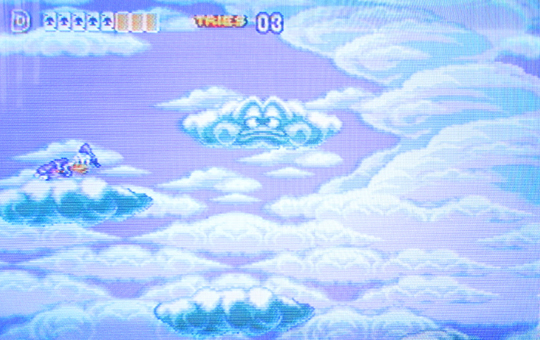 Donald gets into a bit of cloud-hopping. What a happy chap he is!